Experienced gardeners know the value of a good garden bug. Some garden bugs, like the infamous Ladybug, are said to eat thousands of aphids in a single season. Thousands! Hundreds of thousands even! Nice! 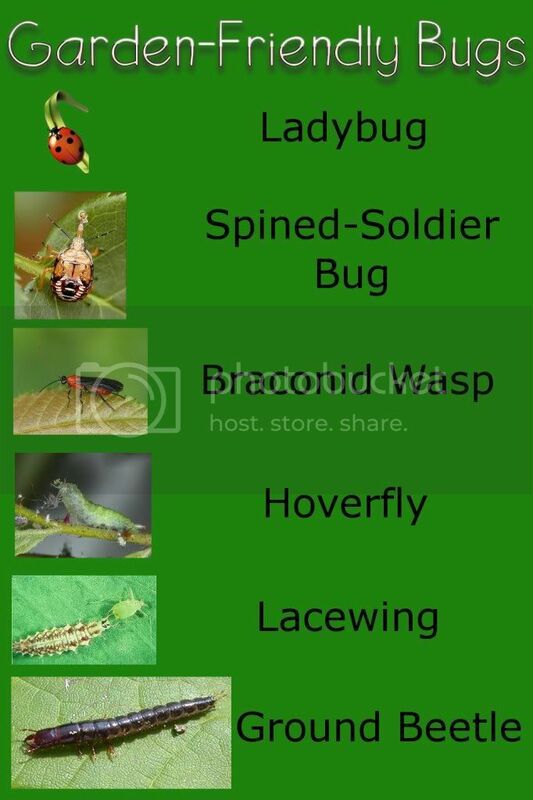 So how do you tell which bugs are garden-friendly? Well, it's tough. But after you read this post, you'll be able to recognize them once you see them. I put together a nice little visual aid for you guys. While there are probably a few garden-friendly bugs I left out, these are some of the most common ones. Ladybugs - They are a menace to menacing bugs both in larvae (meaning young baby) and adult. They also find whiteflies,thrips, and spider mites to be mighty tasty. Spined Soldier Bugs - They eat all the bad guys. Caterpillars, grubs, moths, you name it! Braconid Wasps - Eat the terrible hornworms. Hoverflies - These guys look like the green caterpillar off of A Bug's Life. And like that fat caterpillar, they are always hungry and eat like crazy. Some of the garden pests they eat are aphids, mealybugs, caterpillars (heh), and leafhoppers, to name a few. Lacewings aka Aphid Lions - They call them Aphid Lions for a good reason. In the larval stage, lacewings eat aphids by the spoonfull as well as other small, soft-bodied garden pests. Ground Beetle - They target over 100 different types of insect pests! They, themselves, are terribly nasty looking but they'll do your plants a lot of good if you can stand to look at them. While the list could go on and on, these are definitely some of the most beneficial garden insects you could ever have in your garden. Some other common garden-friendly bugs include earthworms, pillbugs, dung beetles, praying mantises, butterflies, and wasps.